The video's background music included the poem "Qaseedah Burdah" in Arabic, describing Christians and Jews as "infidels" and praising Muhammad in gruesome detail for slaughtering them. The lawsuit, claiming several violations of the First Amendment to the U.S. Constitution, was filed on behalf of Libby Hilsenrath and her minor son. Seventh-grade students at Chatham Middle School were allegedly forced to endure Islamic propaganda and an explicit call to convert to Islam through a disturbing set of videos in their World Cultures and Geography class. TMLC's affiliated New Jersey attorney, Michael Hrycak, filed the lawsuit. TMLC staff attorney, Kate Oliveri, the principle drafter of the federal complaint, observed: "The Board of Education and other Defendants are waging a war against the religious protections afforded by the First Amendment. They attack religious liberty by enticing young school children with a direct call to convert to Islam and providing a step-by-step guide on how to affect that conversion." One of the videos, linked in this press release, seeks to convert students to Islam and is filled with the Islamic religious beliefs presented as facts, as well as pure Islamic propaganda. This five-minute video ends with the prayer "May God help us all find the true faith, Islam. Ameen." • "Allah is the one God who created the heavens and the earth, who has no equal and is all powerful." • "Muhammad (Peace be upon him) is the last & final Messenger of God. God gave him the Noble Quran." • "Lo, We have sent thee (O Muhammad) with the truth, a bringer of glad tidings and a warner." • "What is the Noble Quran? Divine Revelation sent to Muhammad (S) last Prophet of Allah. A Perfect guide for Humanity." • "The Noble Quran: Guidance, Mercy and Blessing for all Mankind." • "The Noble Quran: Without any doubt and an eloquent guide from Allah." • "The Beautiful Quran: Guidance for the wise & sensible." • "Islam: A shining beacon against the darkness of repression, segregation, intolerance and racism..."
This propaganda video also contains excerpts from the Quran stating that Islam is "perfected" religion and the only religion for mankind. And it ends with a call to conversion: "May God help us all find the true faith, Islam." • "He [Muhammad] kept on encountering with them (infidels) in every battle until they looked like meat put on butcher's bench (they were the lesson for those who were willing to encounter with the Muslims)." • "It is as though the religion of Islam was a guest that visited every house of those (infidels and was) extremely desirous for the flesh of enemy..."
• "(The Muslims made their) white shining swords red (with the blood of infidels) after they were plunged; (and the majority of) enemies were having black hair (i.e., most of them were young)." Seventh-grade students were also instructed to view a subtle propaganda cartoon video, 5 Pillars, which included bright, multi-colored words quoting the Islamic conversion creed: "There is no god except Allah and Prophet Muhammad is His messenger." The video concludes with text containing contact information for the students of Chatham Middle School to set up their own mosque tour. Clearly, seventh graders were given a sugarcoated, false depiction of Islam. They were not informed of the kidnappings, beheadings, slave-trading, massacres, and persecution of non-Muslims, nor of the repression of women; all done in the name of Islam. Richard Thompson, TMLC President and Chief Counsel remarked, "What would people say if our public schools taught Christianity as the true faith? After watching this video, I can't imagine any reasonable person saying this is not Islamic indoctrination. Chatham Middle School made a mockery of the First Amendment's Establishment Clause." Continued Thompson, "When Libby Hilsenrath brought her concerns to the school board's attention, on February 6, 2017, they were disregarded. And when she appeared on the Tucker Carlson Show on February 20, 2017 to express her concerns to the Nation, the school community pilloried her. Clueless school administrators across our Nation are allowing this type of indoctrination to take place, and it's up to vigilant and courageous parents like Libby Hilsenrath to stop it." 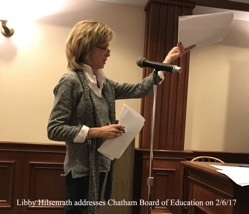 Because of Libby Hilsenrath's attempts to get the Board of Education to remove the videos and end the Islamic indoctrination of her son and the other seventh-grade students, she was subjected to a barrage of personal attacks from her own community: "hateful," "ignorant," "intolerant," "racist," "closed minded," and the list goes on. These attacks significantly intensified after she appeared on the Tucker Carlson Show.